At Content Formula we've advised organisations of all shapes and sizes who are building or improving their intranets. We've helped them navigate the problems that beset many intranets and helped them launch intranets on a solid and sustainable footing. Our intranet strategy consulting services can be bought as standalone work assignments or as part of a larger intranet build project. We can work with you or your senior stakeholders to tease out a coherent and compelling vision closely allied to your organisational objectives. Usually we are asked for a deliverable: a glossy deck that speaks to all stakeholders and users. It's a great way to sell in the new intranet concept. 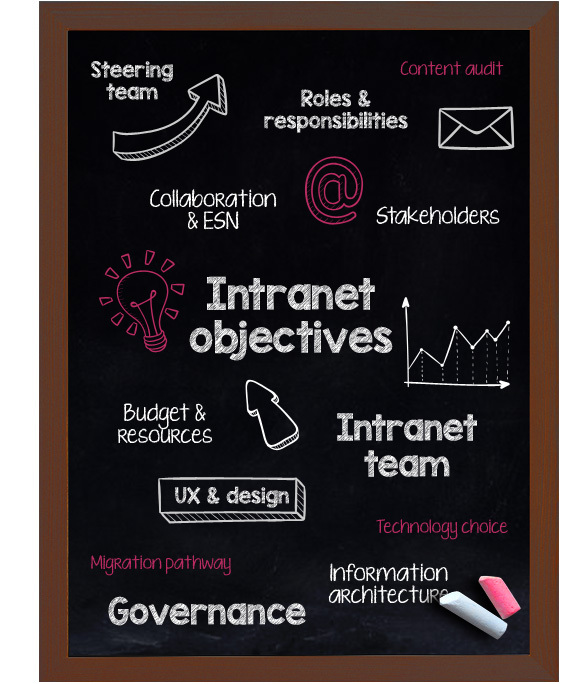 We have a broad and proven toolset that we use for intranet requriements gathering. We select the correct tools based on our experience of knowing what works as well as on budget and time considerations. Our intranet consultants can also help you avoid the common pitfalls that seem like a good idea on paper but rarely work in practice. Getting governance right is crucial. Good governance is not about putting in place burdensome rules and policies but rather being pragmatic. We can provide help and advice but also ongoing services to make your governance work for you. See our Governance page for more details. Closely connected with good governance, we can help you build a comprehensive user adoption plan that goes beyond the launch campaign and will keep users returning for a long time to come. More and more we come across organisations wanting to use the intranet to drive employee engagement around the new strategy, a new initiative or perhaps even CSR. Visit our Employee engagement page to learn more. Getting usability right can make a huge difference to intranet user adoption. Done right, it aids findbility, content discovery, and task completion. Our UX consultants specialise in intranet UX and have a broad set of UX tools adapted for intranet work. Go to our Intranet UX page to find out more. Intranet platforms now offer social tools out of the box. But introducing these can be tricky and can often backfire. We've seen what works and what doesn't and can advise on how to make your intranet social.